All those questions can be answered by first finding a money lender near you who serves your specific needs. There exist multiple money lenders all over the country. Getting the right one can take lots of time sifting through the numerous options. Fortunately, online money lenders make that search simple and easy. All you need to do is narrow down on reliable and trusted online lenders catering to your income bracket, and your debt-to-income ratio. The right online lender will lead you to the best loan places near you. This guide will help you get the right online lender. Several lenders have specific minimum income requirements, which you must fulfill to qualify for a loan with them. That means people in certain occupational categories may not be suited to specific lenders with high minimum income requirements. For instance, Even Financial has a minimum annual income requirement of $45,000. That puts the lender’s services out of reach of approximately 433 occupations, based on data from the Bureau of Labor Statistics. 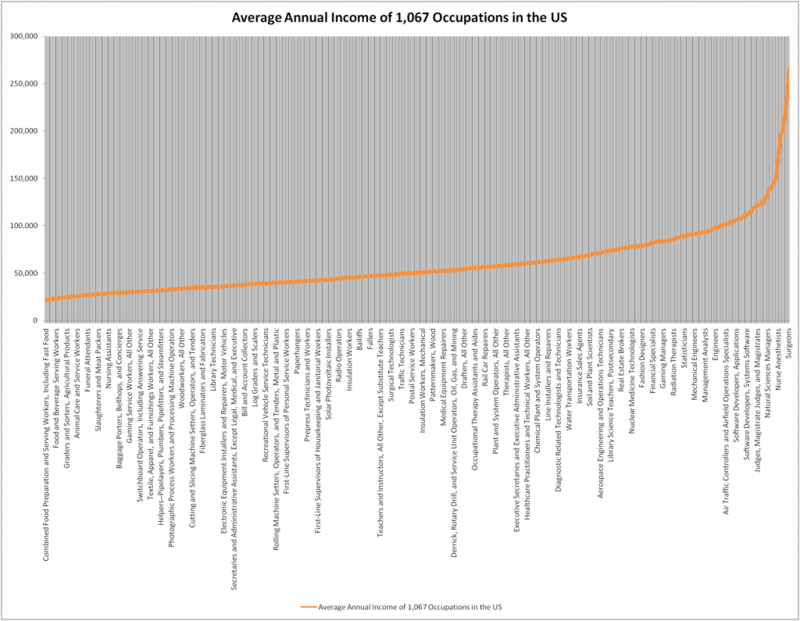 The 433 occupations have an annual income ranging from $21,230 to $44,980. They include such occupations as: fast food and counter workers, ushers, lobby attendants, and ticket takers, amusement and recreation attendants, gaming dealers, dining room and cafeteria attendants, bartender helpers, lifeguards, ski patrol, childcare workers, laundry and dry-cleaning workers, personal care aides, parking lot attendants, graders and sorters of agricultural products, maids and housekeeping cleaners, motion picture projectionists, manicurists and pedicurists, farm workers and laborers, automotive and watercraft service attendants, nonfarm animal caretakers, packers and packagers, and retail sales workers, among others. This makes up almost half of the 1,067 occupations documented by the Bureau of Labor Statistics, as shown in this graph. A lender like Prosper, having an $89,000 average annual income requirement, would serve only 14% of the 1,067 occupations documented by the BLS. Fortunately, lenders like Avant have a low annual minimum income requirement of $20,000. Some lenders don’t even have any minimum income requirement, as seen in this chart. According to the Federal Reserve, American households have an average debt of $137,063. Yet, the median household income is $59,039, based on data from the U.S. Census Bureau. Those two figures produce a debt-to-income ratio of more than 200%. Having such a high debt-to-income ratio could rule you out of potential loans from certain lenders. While considering your debt-to-income ratio, also check your credit score, since lenders have restrictions on the lowest credit score they can accept. Fortunately, you can still get a loan even with bad credit, but you’ll typically pay a higher Annual Percentage Rate (APR), ranging from 18% to 36%, instead of 10% to 28% for borrowers with higher credit scores. Besides asking, “Which are the best bad credit lending companies near me?” you should also ask, “Which are the most reputable and reliable loan companies for bad credit near me? The best lending companies have an impeccable reputation and proven reliability serving many clients over the years. GuideToLenders.com: GuideToLenders.com helps you save valuable time and effort finding direct lenders, since it serves as a reliable loan matching service. They have a wide network of reliable lenders, including Avant, SoFi, LendingClub, Discover, and LightStream. BadCreditLoans.com: BadCreditLoans.com is well known for serving good, medium and bad credit borrowers. Besides, they offer a wide variety of loans. They have served multiple clients since 1998. Upgrade: Upgrade provides loans on fixed interest rates so you can conveniently plan your monthly payments. Borrowers can expect to get affordable personal loans, which can be as much as $50,000. Even Financial: Even Financial makes use of machine learning matching algorithms to ease the process of finding the right personal loan. Their service is quite convenient and well organized, taking out the hassle of getting a loan. Avant: Avant offers its own branded credit products, which are issued from WebBank, member FDIC. The company aims to revolutionize the online lending industry, and clearly has achieved much, having surpassed $3 billion worth of loan originations. Fast5kLoans: Fast5Kloans is uniquely focused on offering short-term personal loans. It will certainly offer the convenience of getting a small loan as fast as possible. Best Egg: Best Egg combines customer insights, modern financial technology and years of banking experience to produce highly customized and hassle-free loans. PersonalLoans.com: PersonalLoans.com offers a mix of lending services including peer-to-peer loans, bank personal loans, as well as a loan matching service. This makes it an interesting one-stop-shop if you want all that under one roof. CashUSA.com: Cashusa.com gives you security, convenience and fast services. Through them, you get access to a wide network of direct lenders. Prosper: Prosper has a long and successful record, being the first peer-to-peer (p2p) lending and investing platform within the United States. Lending Club: Being a peer-to-peer lending platform, Lending Club saves you the costs of traditional bank loans, which gives you better rates. 247LoanPros: This is one loan matching service that will help you get affordable short term personal loans. After evaluating those three major factors, you’re sure to find the best personal loan.